Jean Cocteau's 1946 Beauty and the Beast offers no singing teacups. Instead, this charming romantic fantasy gives us so much entrancing visual poetry that there's no wondering why Disney's creative team, 45 years later, drew more from Cocteau's film than from the original fairy tale. A major artist in the avant-garde scene of 1920s Paris, Cocteau was a poet, playwright, sculptor, and surrealist who hung with the likes of Picasso, Satie, and Stravinsky. For most of his career, moviemaking was not his foremost means of expression. His Beauty and the Beast, though, is not only the most wholly satisfying of his films, it's one of the wonders of black-and-white photography, style, and narrative. It's marvelous, as in "full of marvels." Cocteau dazzles us with such dreamlike imagery, painterly compositions, and (some say) potent sexual subtleties that Beauty and the Beast achieves a fusion of cinema artistry rarely duplicated since. It tells its familiar children's tale of passion and compassion with uncondescending simplicity, yet does so, it seems, through more than just projecting light onto a screen. One of the astonishing things about Beauty and the Beast is how sensuous it is. You can feel its textures against your skin. This is one of the most accessible and enjoyable of Euro "art house" fare. Cocteau's previous stint as a director had occurred 16 years before with 1930's Blood of a Poet, an avant-garde mishmash of hieroglyphic surrealist imagery. Beauty and the Beast's more grounded conventional narrative mindfully pulls cards from the surrealist deck, but it doesn't litter the card table with them. Some of Cocteau's avant-garde colleagues, in fact, tugged their beards at his making such a comparatively mainstream film. By conjuring up an enchanted man-monster living in a forest castle complete with living candelabra and talking mirrors and magic gloves and other fairy-tale trappings, then aiming it all at adults, Beauty and the Beast reminds us that motion pictures can tap into our childlike fears and pleasures without becoming childish in the process. So its lineal descendants aren't the latterday fantasy films that just ape its look; nor are they the empty, tin-plated gewgaws of George Lucas. They are films such as Jean-Pierre Jeunet's City of Lost Children and Amélie. And even Disney's animated reworking remembered that it was adults paying for the tickets. Whether or not there's anything particularly "French" in this is a dialogue perhaps best done over a bottle of 1996 Hubert Lignier Morey-Saint-Denis Cru Vieilles Vignes, though the French have cultivated this quality in their cinema ever since George Meliés invented film fantasy exactly one hundred years ago. In 1946, after years of brutal warfare and Nazi occupation, when they needed their classic fairy tales, Cocteau's powerful personal vision made art out of a home-grown fable in which brutal, bestial ugliness, with blood on its claws, can vanish when faced with steadfast virtue, honor, and beauty (physical and otherwise). An early incarnation of this story first appeared in written form in the 1550s. The earliest French version is an ancient Basque tale where the father was a king and the beast a serpent. In 1697, Charles Perrault popularized it in Tales of Mother Goose. A later adaptation was published in 1740 by Madame Villeneuve. Then in 1757 Jeanne-Marie Leprince de Beaumont wrote the simplified version that Cocteau used as his source. When he brought the 500-year-old story to life on screen, instead of modernizing it Cocteau turned its antiquity to the advantage of his company, a team of astute collaborators who together crafted an eclectic "Once upon a time" neverland. The film's sumptuous visual compositions and atmospheric brush strokes of light and shadow are credited to cameraman Henri Alekan, whose scenes at Belle's rural home point directly to the 17th century paintings of Vermeer. Cocteau compared Alekan's photography to "the soft gleam of hand-polished old silver." Theatrical designers Christian Bérard, Marcel Escoffier, and Rene Moulaert crafted the expressive sets (most famously the Beast's baroque castle) and lavish costumes from inspiration found within the illustrations of 19th century Gothic artist Gustav Doré. When an impoverished merchant (Marcel André), lost in the darkest of forests, approaches a castle seeking shelter, we follow him into an enchanted realm that seems architected within some dark, primal, logic-free chamber of our subconscious. 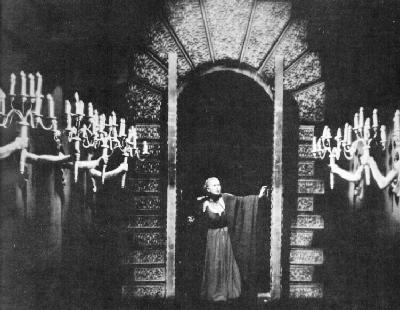 In one of the film's most famous images, a long corridor is lit by candelabra held by rows of living arms growing from the stone walls. Living statues follow the merchant with their eyes. A well appointed dining table serves him a glass of wine. Even day and night are liquid concepts in this dreamy domain. The master of the house does not appear until the merchant leaves through the garden and plucks a rose as a gift requested by one of his three daughters. The Beast, a huge manlike figure in regal garments framing a feral, leonine head, catches him in the act. 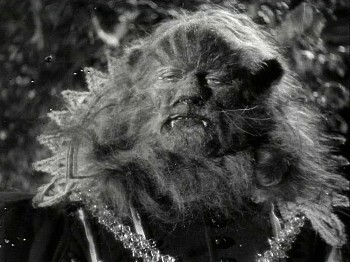 At first the Beast (Jean Marais, working with his stunning mask instead of just through it) condemns him to death. Then it strikes a cruel bargain with the terrified man  it will release the merchant only if he swears that within three days he will either return to meet his fate, or one of his three daughters takes his place. It's daughter Belle, of course, who selflessly returns to the Beast's enchanted castle to become its hostage. As played by luminous Josette Day, Belle is a maiden pure and just and honor-bound. She takes her father's place by sneaking away from their home on the Beast's magic white steed. And who can blame her? She lives a scullery maid's Cinderella-before-the-ball existence with her two shrill, greedy sisters and a wastrel brother. For romance, she is courted by a superbly handsome, yet shallow and callous, lout named Avenant (also played by matinee idol Marais). His attempts to win her love are thwarted time and again by his appearance and his reversion to the most primitive animal impulses. The Beast is a beast in more than just appearance. Though he's clad in the jeweled velvet finery of a nobleman, he appears at Belle's bedroom door a roaring monster filthy with the blood of the hunt. He could be Freud's Id made manifest, brutish and bestial  after slaughtering forest game, he leaves the carcasses strewn about the grounds, smoke rising from his massive furred hands signifying a fresh kill. But here's an Id in conflict with higher yearnings. "I have a good heart," the frightening and alluring creature says, and indeed his attentions toward Belle are protective and gallant. However, it's a heart tormented by self-loathing and raw animal instincts that the Beast cannot control. Heart or no, she's still a prisoner, and not even the tear that transforms into a diamond on her cheek can make that better. Eventually, he grants her the freedom to return home via a glove that will magically transport her there (the shot of her materializing out of a wall is one of the more memorable fantastical effects). He tells her that if she does not return of her own free will, then he will die heartbroken. In this act of sacrifice, we see as clearly as Belle does that the Beast's heart may be winning its battle over the ferocious flesh surrounding it. Meanwhile, Avenant and Belle's brother  spurred on by the sisters jealous of her newfound jewels and clothes  set out armed to slay the monster and, while they're at it, plunder his riches, which include a glimmering temple to the goddess Diana wherein the Beast keeps his most precious secrets. In a striking addition to the tale, it's within the temple that Cocteau reveals handsome Avenant to be exactly as monstrous on the inside as the Beast is on the outside. In that same moment, it's Belle's steadfast honor and trustworthiness, as well as love, that break the spell holding the Beast (no surprises there, I assume), and what Cocteau does with the Avenant/Beast duality is quite fetching. Cocteau wrote that he desired "to make the Beast so human, so sympathetic, so superior to men, that his transformation into Prince Charming would come as a terrible blow to Beauty." He succeeded. 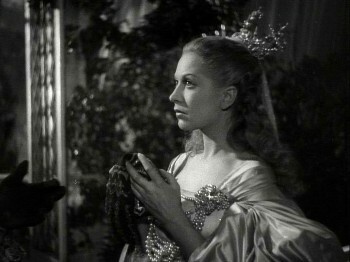 Not only is Belle's initial reaction to the sudden shift from Beast to Prince definitely not one of fawning delight, but, as Roger Ebert reports it, at the premiere screening Marlene Dietrich was holding Cocteau's hand when the crucial moment arrived and she called out toward the screen "Where is my beautiful Beast?" Even then the enchantments aren't done. In the final shot the newly transformed Prince takes Belle by the hand and they take a literal flight of fancy that leaves us with an ending more startling than any mere "They lived happily ever after." "The realism of the unreal"
In the folklorists' system for categorizing stories, the number 425A is assigned to tales of the type "The Monster or Animal as Bridegroom." Seeking psychosexual subtext within the imagery of fairy tales became a popular 20th century exercise. The extraordinary writer Angela Carter made much of her career out of exquisite modern reinterpretations of old, tellingly universal stories, including this one. Much interpretive hay has been made out of to what extent Cocteau used Freudian imagery and other metaphorical toolboxes while creating Beauty and the Beast. There's certainly plenty we can walk away with, if we choose to. Belle's bedroom is a frequent scene-setting device and night after night she rebuffs the Beast's bedroom entreaties. Yet throughout Cocteau's film we watch the gradual awakening of both her attraction and her sexuality, as well as the Beast's fight to suppress his wild animal nature. When she commands the blood-spattered paramour to leave, watch how, broken, he supports himself on a feminine statue, then shambles away after hesitating just long enough to cup its bare breast. (Let's not even think about what that means to a living statue). Do the Beast's dark, dream-logic forest and castle represent our secret subconscious places? Is it therefore a domain we must learn to be at home in if we're to know our  or our partners'  true selves? Stephen Sondheim's adult-themed stage musical Into the Woods sure seemed to think so. Might the Beast, whose good heart is hidden by an ugly visage, represent Cocteau himself, whose skin was stricken by eczema so severe that he was in constant pain? His having the Beast played by his longtime lover and muse, Marais, may or may not add another layer of significance to Cocteau's creative imagination. Not that any of that really matters. It is worth remembering, though, that in aspiring to achieve what he called "the realism of the unreal," Cocteau blended magical motifs with grounding elements of everyday realism to achieve something "not to be admired, but to be believed." By methodically sending a taproot into some universal loam existing just inside our skulls, Beauty and the Beast draws nourishment from images, both realistic and defiantly anti-realistic, that you don't need to be French to share. Cocteau recorded his thoughts during production in a journal published as Beauty and the Beast: Diary of a Film. "The movie screen is the true mirror," he wrote, "reflecting the flesh and blood of my dreams." Later he added, "I wonder whether these days of hard work aren't the most delicious of my life. Full of friendship, affectionate disagreement, laughter, profiting from every moment." Finally, when the film was released, it met a lukewarm reception at Cannes. Critics turned up their noses at such effort being employed on material as trivial as a fairy tale. This despite Cocteau's view that it served a necessary spiritual need in post-occupation France. In the 1940s press book for the film's U.S. premiere, he expressed faith in a greater acceptance by less jaded audiences over here. "There are three reasons why I have high hopes that Americans will readily grasp my intention. First, America is the home of Edgar Allan Poe, secret societies, mystics, ghosts, and a wonderful lyricism in the very streets. Second, childhood remains longer within the soul than it does here in France, where we try to suppress it as a weakness. The America that now influences French literature is already ancient history for you, and the American is looking forward to something other than what astonishes us but no longer astonishes him." Whether or not there's anything particularly "American" in this is a dialogue perhaps best done over bottles of Miller Genuine Draft. I'm buying. Originally transferred to disc in 1991, Beauty and the Beast was one of The Criterion Collection's earliest releases. Now, almost 200 releases later, the film is back and upgraded with a gorgeous all-new print plus features that make this definitive edition much more than a reissue (even though the DVD's keep-case maintains the original series number "6" on its spine). "People have decided once and for all that fuzziness [soft or out-of-focus shots] is poetic," Cocteau wrote. "No, since in my eyes poetry is precision, numbers." Because he aimed "for the clean, sculptured line of poetry instead of the usual diffuse lighting and use of gauze for magical effect," this disc's high-definition transfer, with its sharp, clean, and deep black-and-white imagery, would make the poet-director very pleased. The new print comes from a painstaking restoration of the original 35mm French nitrate negative. Taking seven years to complete, the restoration team cleaned the negative with the kind of fanatical attention that Franciscan monks devote to an illuminated manuscript. They used the MTI Digital Restoration System to remove thousands of instances of dirt, debris, and scratches, and repaired sprocket holes so the film would run smoothly at its proper speed of 24 frames per second. A few instances of missing frames still exist, though the resulting jumps are minor and easily ignored. The soundtrack was mastered from an optical soundtrack print and restored at 24-bit using digital audio tools to reduce tics, pops, hiss, and other distortions. Georges Auric's score gets its due power and attention in strong, clear DD 1.0 monaural. The English subtitle translation is "new and improved." An audio commentary by film historian Arthur Knight is carried over from the original Criterion edition. Knight is an informative and critically savvy academic. He's rather dry, but he fills his time well and his knowledge of the film's context as cinema art and within Cocteau's work (he reads extended passages from Cocteau's film diary along the way) makes this an impressive and welcome Film Studies lecture. An audio commentary by writer/cultural historian Sir Christopher Frayling is new to this edition. Recorded in 2001, Frayling is a livelier speaker than Knight, with a jauntier style and a sense of humor. His track covers plenty of production details, such as the endemic post-war shortages that crippled production, and he's quick to point out items of interest as we're watching. It's a fine track that complements Knight's admirably. Of the two tracks, this one is also the better recording. A nifty treat is the original opera written for the film by composer Philip Glass. Glass composed his Beauty and the Beast to be performed live while the film is projected behind the orchestra and singers. As such it has led to quite a few successful stagings around the world. Here it's offered as its own DD 5.1 audio track. Naturally, how well you personally welcome this option depends largely on any prejudices you might have for or against opera (or Glass) in general. It's certainly an experience different from the main soundtrack. That said, Glass' score fits the film very well, is beautifully orchestrated, and makes terrific use of its full, pristine, immersive 5.1 sound spread. Screening at the Majestic (26:48)  This 1995 documentary features interviews with several of the film's cast and crew, including Marais and Alekan, at the special screening that showed off its 1995 restoration. In French with English subtitles, it offers worthwhile reminiscing about the troubled production. Interview with cinematographer Henri Alekan (9:14)  This television interview with Cocteau's director of photography was shown in Luxembourg to commemorate the 1995 restoration. It too is in French with English subtitles. Another French TV excerpt, this time from 1964, is a clip from Secrets Prefessionels: Tête à Tête (8:48) spotlighting Beauty and the Beast's makeup artist, Hagop Arakelian. There's the original theatrical trailer, narrated and directed by Cocteau, and the restoration trailer. Both are in subtitled French. Also made at the time of the 1995 restoration was a French restoration demonstration (4:07), a mini-documentary about the procedures involved. A stills gallery collects numerous behind-the-scenes and publicity shots. Within the DVD case, a hefty booklet (Criterion is really good with these) provides an excerpt from Cocteau's 1940s U.S. premiere pressbook, Mme. Leprince de Beaumont's original fairy tale translated from the French, and notes by Francis Steegmuller from the definitive book Cocteau: A Biography. Also here are photos, cast and crew credits, chapter titles, and information on the DVD restoration and transfer. Completist collectors will notice that what's not here is the 1991 edition's excerpt from American TV's Cinematic Eye. So find or hold on to that earlier DVD if you want the 23-minute extra on the visual influences Cocteau saw in the paintings of Vermeer and Dore.